London: Ford & West, Imp. 54, Hatton Garden. 1852. 6pp., small 4to. Stitched into brown wraps with lithographed title on cover, in pastiche of Gothic design, including monogrammed initials 'IS' in shield, with the letters picked out in red. In fair condition, aged and worn. An extremely scarce item (no copies found on OCLC WorldCat or COPAC), whose text and illustrations cast light on the practices at the Royal Academy in the mid-Victorian period. 136pp, 8vo, more recent brown paper wraps (i.e. rebound(, contents with minor staining, good condition. At the beginning of each gathering the statement, "VOYAGES and TRAVELS, No. XLV. Vol. VIII"
[ Sir George Hayes, The Times and the Crimean War. ] Manuscript Copy by Sir Richard Harington of Hayes's squib 'A Bill For the more effectual Prosecution of the War with Russia, and for securing the Liberty of the Press & for other purposes'..
No place. 'Ordered to be printed | February 1855'. 10 + pp., folio. On ten leaves of grey paper, attached at a corner with string. In good condition, lightly aged. Folded into a packet by Harington, and docketed by him: 'Squib in "The Times" by Sergeant Hayes afterwards Mr Justice Hayes | Prosecution of the War with Russia, & Liberty of the Press' The text, with marginal commentary, appears to be identical to that published in London in February 1855 by William Stevens, Printer, 37, Bell Yard, Temple Bar. [Georgian London.] Two lithographic engravings: companion pieces both headed 'Casualties of London Street Walking', and titled 'A Faint Impression' and 'A Strong Impression', showing the fine clothes of fashionable figures sullied by street hawkers. Both engravings published on 2 October 1826 by S. & J. Fuller, 34 Rathbone Place, London. The two engravings in good condition, with light signs of age, and with 'A Faint Impression' with some offsetting in light pink (not entirely displeasing). Both headed above the image 'Casualties of London Street Walking', with the title and publication details below the image. ONE: 'A Faint Impression.' Dimensions: image, 23.5 x 18.5 cm; plate, 27 x 20 cm; paper, 29 x 22 cm. 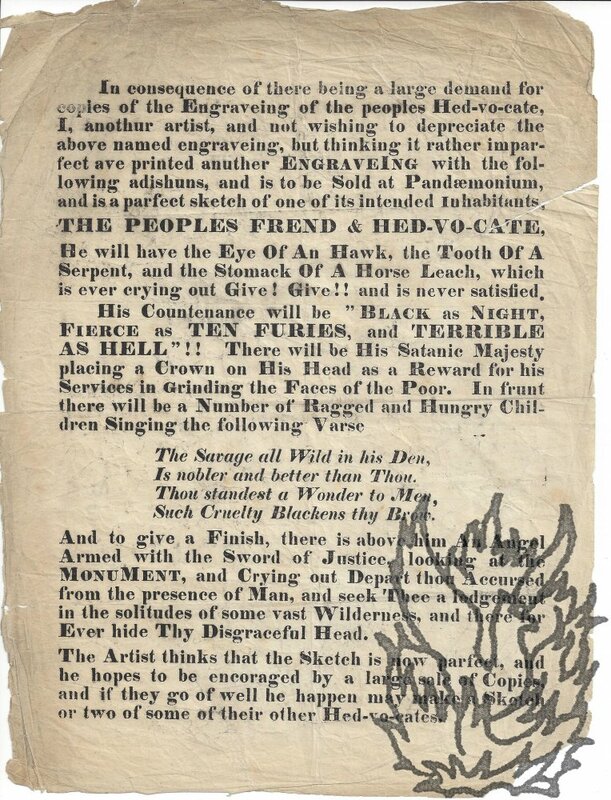 [Satirical handbill obituary referring to the London Conference of 1864.] Lost, Stolen, or Strayed, The British Lion. Without place or date [London, 1864.]. Printed on one side of a piece of 17 x 12 cm paper. Aged and worn, and trimmed down. Reminiscent of another Victorian spoof obituary - that which led to the Ashes cricket series between England and Australia - the full text reads: 'LOST, STOLEN, OR STRAYED, | THE | BRITISH LION. | Whoever finds him is hereby requested to KEEP him, as he is no longer of any use. | N.B. - He was last seen with his Tail between his Legs. | Obituary. | On Monday, the 27th inst., of a severe attack of Non-intervention and Court intrigue, | THE | BRITISH LION, | His end was - Peace ! ! One page each, 4to and 8vo, good condition.[1990?) I wouldn't mind talking to your students but I'm not at all sure I'd be any good as a Tutor [...] In fact I might have an adverse effect on [?] students if I had to set projects and then read what they had written. I don't think I'm an adequate judge of other people's work: I know when I'm satisfied with my own work but that's as far as my judgment goes. Still I'm all in favour of encouraging writing, which is what your course sets out to do"; (1991) "I am off to Scotland for a bit but my wife Nancy will forward my letters. [William Hurrell Mallock, novelist and conservative writer.] Two Autograph Letters Signed ('W. H. Mallock') to 'Lady Dorothy [Nevill]', with his short story 'Positivism on an Island: The New Paul and Virginia', extracted from the Contemporary Review. The two letters from L<airbeck?> Cottage, Keswick, Cumberland. 28 and 31 March 1878. The printed short story extracted from The Contemporary Review, London, vol.32, 1878. The present short story, based on Bernardin de Saint-Pierre's 1787 novel Paul et Virginie, was expanded into a novel published by Chatto & Windus in the same year, and is regarded as a significant example of the dystopian literature popular during the period. The three items are attached to one another along margins. All in good condition, on lightly aged and worn paper. Letter One (28 March 1898): 2pp., 12mo. He explains that he is hoping to send her a copy on the following day 'a copy of a new production of mine, which is to appear in the "Contemporary Review". J.H. Driberg, Lecturer in Anthropology at Cambridge University. W1, Some Customs and Institutions of the Inhabitants of Mayfair:An unpublished 1930s parody of an anthropological study, with satirical force, of London's wealthiest district, by J. H. Driberg, Lecturer in Anthropology at Cambridge University.Unpublished manuscript parody by Jack Herbert Driberg (1888-1946), Lecturer in Anthropology, Cambridge University, 1934-42, author of several mainly anthropological works; and brother of the Labour MP and gossip columnist 'William Hickey' Tom Driberg (1905-1976), written under the pseudonym of Ludwig H.
[Printed pamphlet.] A New Art Teaching How to be Plucked, being A Treatise after the Fashion of Aristotle; Writ for the Use of Students in the Universities. To which is added, A Synopsis of Drinking. By Scriblerus Redivivus. Fourth Edition. Oxford: Printed and Published by J. Vincent; 1836. 12mo: viii + 40pp. As a fold-out tipped-in onto p.23 is 'A Synopsis of Drinking, formed according to the Categories of Aristotle' (1p., folio); and following the text is a four-page catalogue of 'Books published by J. Vincent, Oxford; Whittaker and Co.; Simpkin and Marshall; and Sherwood, Gilbert, and Piper, London.' Side-stitched, in original grey printed wraps. 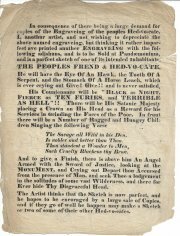 Fair, on lightly-aged paper, with small burn-hole to dogeared front wrap, which carries the ownership inscription of 'F. Saunders / Trin Coll'. A satire on the dissolute ways of the Oxford undergraduate.